On Sneinton Dale: the PlaceCheck walk group take a break to discuss what they've seen. A "PlaceCheck" walk and talk held by Alchemy on Tuesday attracted more than 20 local residents, planning professionals and council officers to participate. The event was intended to raise awareness of new community rights available under the Neighbourhood Planning policy. Local communities now have the opportunity to work with their local planners and in consultation with developers to come up with plans for their areas. In contrast to the existing planning system which can lead to a lot of conflict between developers, planners and communities, the new system is intended to encourage developments that the community wants to see, and that fit with local planning policy. Lively debate: the PlaceCheck walk generated a host of concerns and ideas, along with a lot of passion for the area. The walk generated lively discussion and feedback over the delicious buffet at TRACs from Sneinton Market stallholder Beccy's Global Kitchen. Sue Jobbins of Shaping Communities gave us the low down on the process that local communities need to go through in order to develop their plans, while Alchemy's Steve and Tom gave a presentation on the 10 key aspects of the Neighbourhood Planning system. 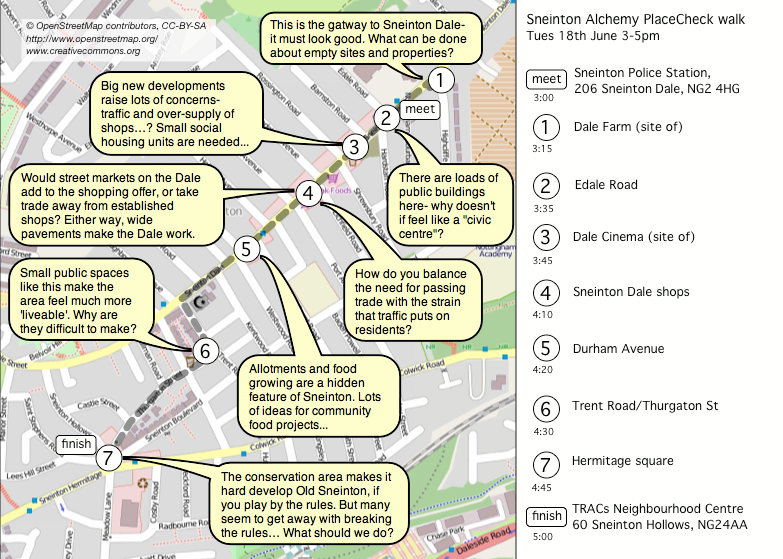 Further walks are planned to focus on different areas of Sneinton and Bakersfield- if you are interested please contact tom@sneinton-alchemy.com or Steve on 07972049539.